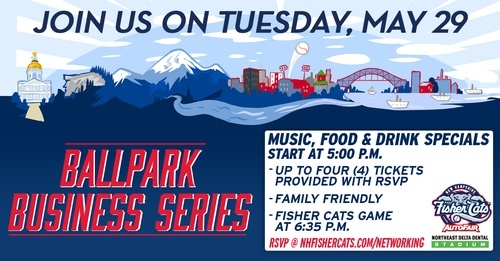 Register now for the Fisher Cats Ballpark Business Series Mixer on Tuesday, May 29. Tickets are complimentary for chamber members and your guests making it a great opportunity to host colleagues, friends or family at a game and see the future Red Sox, the Portland Sea Dogs, take on the future Blue Jays! Free for Chamber members. You may request up to 4 tickets!